The Nikon D90 beautifully combines the best of digital technology with quick and efficient camera handling. 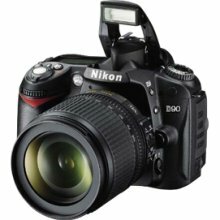 Compared to the Nikon D70, it has a larger LCD display and also the live view along with the new face detection system. I played with it over the weekend and it really blew me away. The DX 18-105mm lens came with the camera. We also bought the Nikon 55-200mm f/4-5.6G lens for outdoor pictures. With everything, the total came to $1300.00. Money well spent though! We are going to make this as an early Christmas gift for ourselves. I have been told to put only "gift from the heart" on my Christmas wish list this year. Below are new pieces of jewelry that are available for sale. From now until Christmas, all jewelry are $10.00. Please stop by PLG's closet and check them out. Wow, the quality is amazing! What a great investment. I love the photos and I really like the last necklace! so you dont edit the background in the photos? i know DSLRS focus on an item and blur the background.. but it is amazing! do you edit it to make it extra blurry, or do they just come out that way? the camera quality looks amazing!! i need a good camera too. so expensive, but i can see it is worth investment. @The Little Dust Princess Thanks Jess! The quality of those photos really blew me away. @siwing I didn't edit those photos at all. I set the focus on the jewelry and blur the background. The blurriness can be controlled by setting various apertures. @Ping It is pricey for sure but definitely worth investment if you're looking for a professional camera and interested in photography. amazing photos!! looks like you definitely invested in a great camera and lens! Terrific photos, I have been wanting to upgrade too but can't see myself paying that much for a camera that I only use to take outfit pictures. :) My D40 works fine for my purposes but I am so jealous! Every time I see photos where the foreground object is so crisp and clear and the background sort of blurs, it makes me want to buy my own DSLR! The depth perception is just amazing on these cameras. You really captured them in these photos. So pretty! Wow those jewelry shots are amazing! Look at how the second one sparkles. Can't wait to see your outfit photos with the new cam! WOW great new present! I love my slr too! Oh my, did you see how it captures the shine of the bling?! WOW! Perhaps I should put SLR on my Santa list too! Good for you!! I am afraid of SLR because it doesn't self focus right? LOL I need something I can point and shoot- no patience to learn that stuff but the quality is AMAZING!!!! Great photos! You will get a ton of use out of it for sure. congratulations on your new dslr! i've had mine for almost 4 years now and i love it to death. what a lovely new camera. it takes stunning pictures. Lucky girl to get that new camera! It takes great shots! I'm glad you guys got a new camera to play with! Photography is such a fun hobby and I encourage everyone to get out there and shoot some more! Remember, it's not the camera that takes great shots, it's the photographer :) So good job to you!